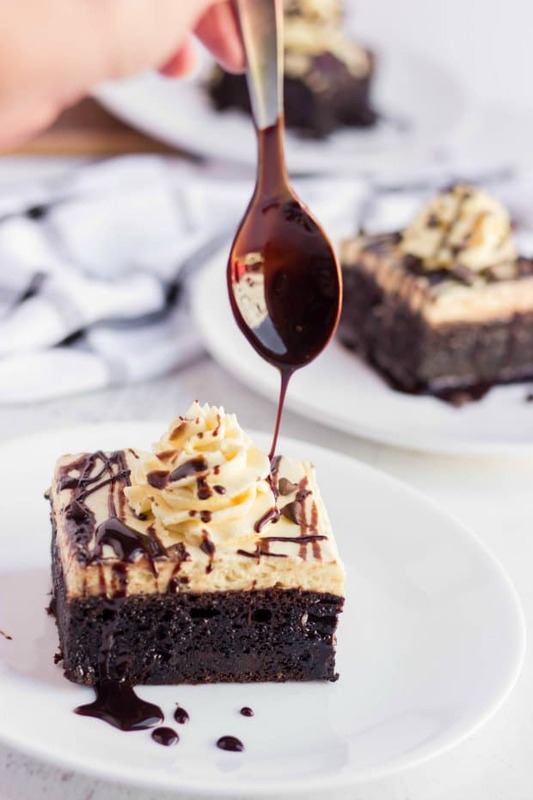 This Chocolate Poke Cake is rich, moist, chocolate, and topped with a whipped coffee frosting – plus the added flavoring of mocha. For every family birthday, if the desserts aren’t ordered from our favorite bakery, then they’re made by me. Treat yourself to this special Red Wine Chocolate Cake. This Carrot Cake is amazing! I love poke cakes! This Sea Salt Caramel Carrot Poke Cake was one of my most popular recipes last year! I think that’s a good indication that everyone loves a good poke cake. Historically colorful Jello was used with white cakes to create rivers of surprise color and flavor into what was usually a boxed cake mix. Easy-peasy, yet super fun for holidays, Sunday suppers, and the neighborhood barbeque. 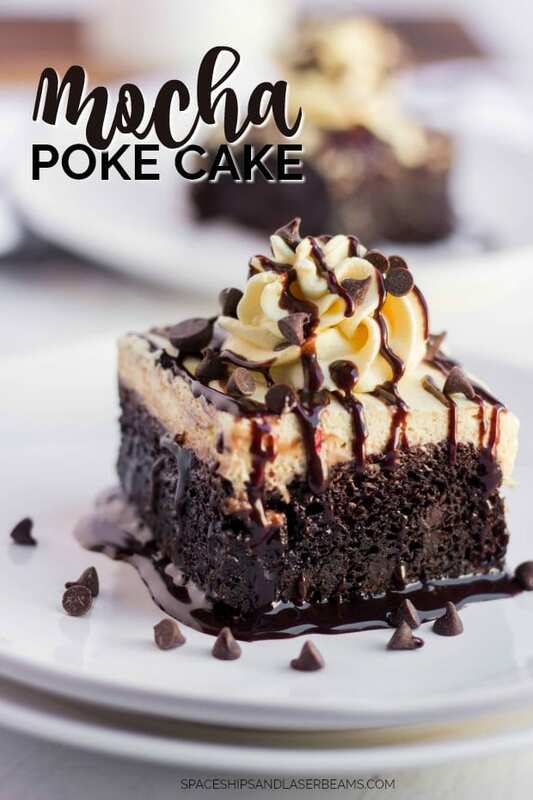 These days, Poke cakes are all different flavors and filled with things like sweetened condensed milk, fruit puree, pastry cream… and my favorite… CHOCOLATE! The base is a rich chocolate sheet cake that starts from a mix (because, did I mention easy?) 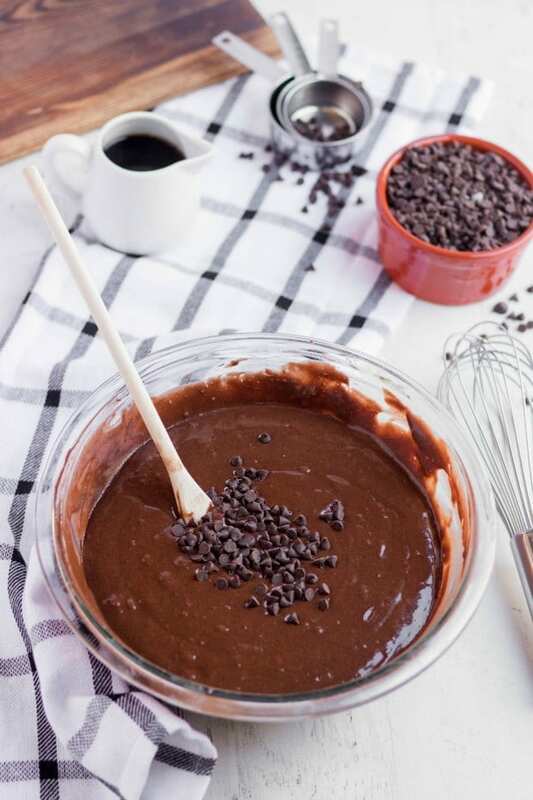 and is made extra rich and moist with some additions such as chocolate pudding mix, sour cream, chocolate chips, and a bit of espresso powder. 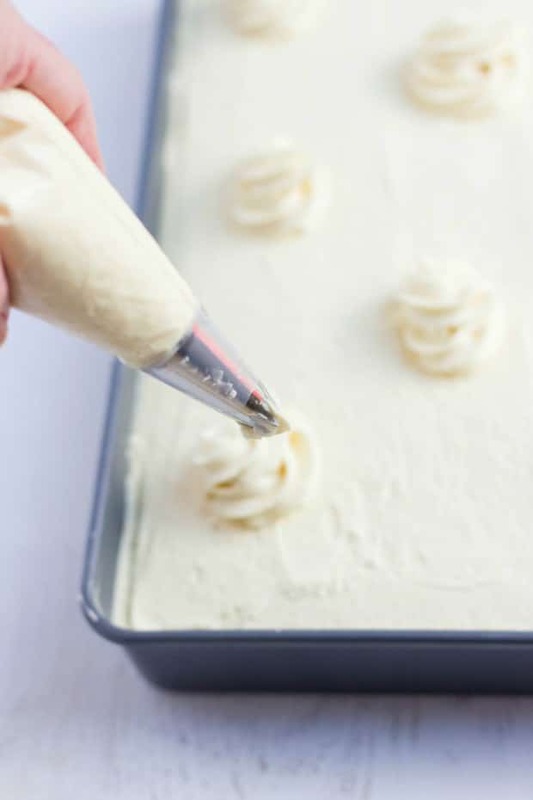 Once the cake comes out of the oven, you can use the handle of a wooden spoon to make evenly spaced holes across the cake. 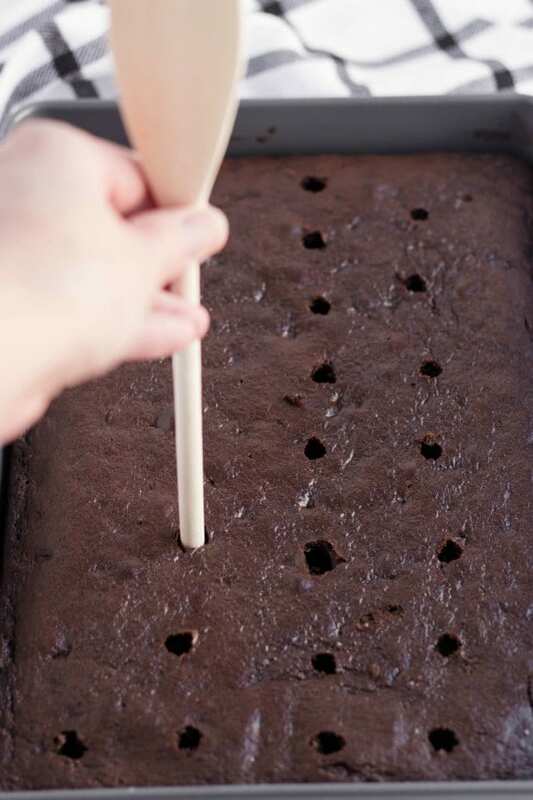 Pour fudge (or keep it easy and use a bottle of chocolate syrup) across the cooled cake and let all that chocolate goodness seep into the holes you poked in your cake. When the cake is totally cooled, top it with a rich, homemade cream frosting and drizzle with chocolate sauce. You will seriously never put a more richly chocolate piece of cake in your mouth. The vanilla flavored frosting is just the right thing to balance all that chocolate. Now you’ve got what is probably the easiest and most delicious cake ever! Not bad, eh? Looking for more Poke Cake Recipes? This Sea Salt Caramel Carrot Poke Cake is divine! Who doesn’t love Nutella?! 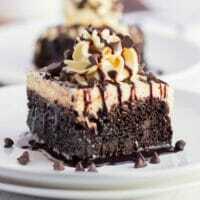 You have to try this Nutella Poke Cake too. I’m totally obsessed with the best chocolate cake! Grease 9 x 13 x 2 in baking pan. Mix all ingredients together in a large bowl or stand mixer until fully combined, scraping down the sides as necessary. Pour batter into the greased cake pan and bake for 35-40 minutes, or until toothpick comes clean. Remove from pan and allow to cool in pan. 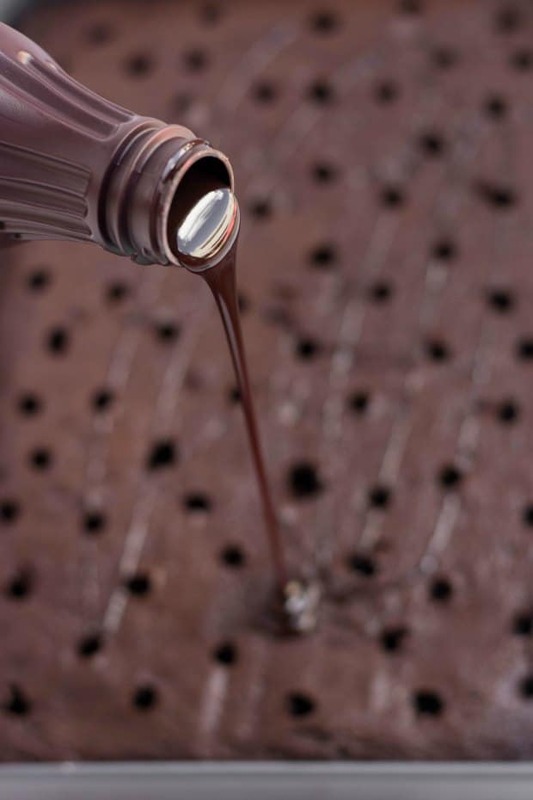 Once cake has cooled, poke holes in the cake, and pour hot fudge or chocolate syrup evenly over the cake. Combine all frosting ingredients in a stand mixer and beat until light and fluffy, about 2-3 minutes. Spread frosting out over the top of the cake and drizzle with additional chocolate syrup. Rebecca is a northwoods girl with a passion for writing, baking, and crafting. She refuses to eat pointy ended french fries, she's married to her geek of a high school sweetheart and enjoys seeking out life's next great adventure! 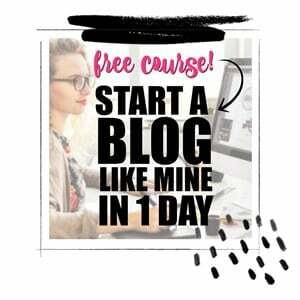 You can check out more about Rebecca on Living Better Together. Yum – this is a favorite for us, I can’t wait to make it again! Absolutely delicious and the fam were very happy!